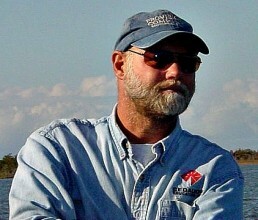 Captain Bob Rust started Waterbug Tours in 2003. His knowledge of the local waters will translate into a great tour for you along the Beaufort waterfront. You can relax aboard Captain Bob’s retired U.S. Navy captain’s launch while going in search for local wildlife. Captain Bob’s 16-passenger vessel comes complete with cushioned seating and a covered top providing shade on the boat. Its unique blue and white facade is a familiar scene touring the historic Beaufort waterfront. Captain Bob will also tell you about the best places to eat and the local sights not to miss! All tours are led by USCG-licensed captains with extensive local knowledge. Captains are trained in first aid and CPR.